It’s time for the US Open! The biggest event of the hard court season is upon us. Can Simona Halep win her second major of the year and put a cherry on a very successful hard court season? Is Serena healthy enough and able to perform at even 75% of her peak? Will Sloane Stephens win back to back US Opens putting her in the same category as the greats? Perhaps, and much to this author’s delight, Aryna Sabalenka can continue to destroy competition like the Amazonian warrior she very well may be? Or possibly someone else finds their very best at the perfect time to surprise us all? There’s so much excitement & unpredictability in the women’s game. I can’t waitto watch and handicap all this great tennis. In preparation for the next 2 weeks, let’s take at the performance totals and spreads in the past. The tables above show the % of matches that go over a certain total based on the round for the US Open and your average hard court tournament. I’ve bolded and boxed the point in each round when historically a total goes over 54.6% of the time or more. Why 54.6%? When betting on totals you will have to pay anywhere from -110 to -120 and maybe more. I’ve chosen -120 as my base price and to be profitable at that price I need to win 54.6% of the time or more (Hint: if the price is higher you need to win at greater than 54.6%). So when looking at totals the next 2 weeks I’ll be looking to bet over any number left of the boxes and looking to bet under any number right of the boxes. The line of demarcation seems to be 19, so if the total is less than 19 look to the over. If the total is greater than 19 lookto the over. This, of course, is just a guideline. It helps to have a stake in the ground while wading through the dozens and dozens of lines available the next few weeks. An interesting trend we can see is that matches tend to get longer in the semi-finals and finals. Matches in those rounds only go over 18.5 50% of the time. In other rounds these rates are 55% or even higher. Look to avoid unders as the tournament progresses. Another thing that sticks out, US Open totals have much greater variety than your average hard court tournament. The table in the bottom has relatively tight percentages for each total, all the bolded & boxed points are on the same number. The US Open as seen in the top table is much more variable. So if we see a lot of overs or unders in the early rounds don’t assume those trends will continue. But what about spreads? How close do US Open matches tend to be? The tables above show the % of matches that have a had a spread less than a certain number of games. For example, in the round of 128, 59.0% of matches had a spread less than 6.5. Said another way, a spread of +6.5 games would have covered 59.0% of the time. Unfortunately, there isn’t a good database that has historical spreads, so this is does NOT mean 64.1% of matches did cover +8.5. I would love to put that table together, but sadly the data is unavailable to me at this time. 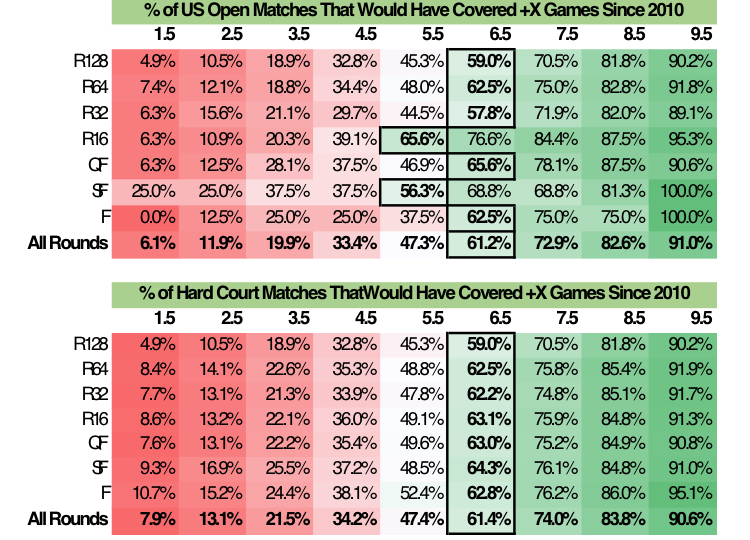 Let’s pause, take that in for just a second, ON AVERAGE, a hard court match finishes with a 6 game spread. For the sake of comparison, men’s best of 3 sets tournaments average just under a 5 game spread on hard courts. Ladies’ matches tend to have bigger wins. Could this be because women break more often? Is there a bigger difference in top talent and bottom talentin the women’s game than we see in the mens’ game? A smarter person could answer these question, but we can see clearly ladies’ matches are usually not close. How can we use this information? When looking at game spreads the next few weeks don’t be afraid to take someone -4.5 or even -5.5. To a lot of tennis handicappers these numbers would be too large to bet, but based on historical % it’s not that crazy. Hopefully this has helped you set your expectations for what should be a great tournament full of memorable matches. These numbers can be extremely helpful, but they are certainly not the end all, be all. Outside of injury & fatigue, a tennis match comes down to the head to head matchup. Looking at the names involved, how their styles line up and how they’ve played historically is of the utmost important. So be sure to do your homework and dig into the players in each match that catches your eye. Use the tables and information above to help your eyes catch the right matches.